John Paesani (l) teamed with his colleague from The Bay Club (Mattapoisett) Ben Egan, to shoot 7-under par 65, at the Magnolia Club at Walt Disney World in Orlando to win the 2019 New England PGA Winter Pro-Pro. 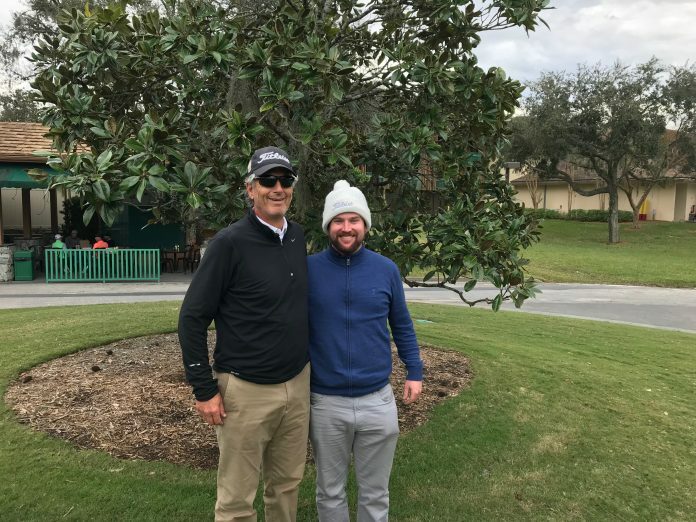 ORLANDO, Florida – If the end of 2018 wasn’t outstanding for John Paesani, (The Bay Club at Mattapoisett) when he cashed out the Hole in One Pool for $24,000, he is starting 2019 on the same foot after winning at the New England PGA Winter Pro-Pro at the plush Magnolia Course at Walt Disney World in Orlando. Paesani teamed with his Bay Club colleague Ben Egan, and the duo fired a 7-under par 65 on the course that hosted the PGA TOUR for over 30 years. Paesani and Egan combined for 7 birdies and no bogeys, with Paesani carding four and Egan three over the 6,500 yard layout. In fact, Paesani shot 68 on his own ball, an impressive score regardless of the format. The course played tough with varying wind speeds and unseasonably chilly temperatures with mixed sunshine, and many of the professionals were showing some rust midway through their winter season. Three teams carded a 5-under 67 to finish tied for second place. The brotherly duo of Steve and Tom Rourke from Event-Man and Cummaquid respectively, Rico Riciputi and Bob Bruso from Wentworth by the Sea and Blackstone National respectively, and 2018 champions Jeff Seavey and Shawn Warren of Samoset Resort and Falmouth respectively.